Our concern of the sculptural representation of Karaikkal Ammai has to be seen conjointly with the Political Connections of Rajaraja I and his son Rajendra Chola I in the far east. Ample evidences on the Tamil Connection in Southeast Asia have been provided by the available Tamil/Sanskrit inscriptions related to both these Emperors found in Tamilnadu/Southeast Asia. It is important to understand the feats of Rajendra’s father – Rajaraja Chola the Great, who laid a stern carpet of friendly maritime relations with the Southeast Asian countries, that provided a firm pathway for the son to go beyond friendly relations and have a stronghold in trade as well as political supremacy. While we discuss the religious culmination of both Tamil and Khmer Empires through the specific travel of iconography of Karaikkal Ammai during early 11th century, the extended economic connections of the Maritime Champions of Southern India with other Empires of Southeast Asia provide important resources. It is also well known that the ancient Tamils had successful economic ties with Romans and Greeks before Common Era as per exclusive literary evidences in Sangam Tamil Literature. The entirety of Tamil Land during the first millennium saw vast changes in the Ruling Kingdoms – Chera, Chola, Pandya and Pallava which took turns in capturing respective terrains. Simultaneously, the Maritime Traders from different kingdoms of Thamizhagam and their respective Guilds settled in various Southeast Asian countries never seemed to have seized activity, irrespective of the change in rulers in home land – Thamizhagam. The Sea has always proved a strong Livelihood Entity for the coastal kingdoms of South and Southeast Asia… be it the yesteryear Pallavas, Cheras, Cholas and the Pandyas of the Tamil Land, Champa, Chenla, Khmer, Srivijaya, Lanka and others in Southeast Asia. The art of tackling forceful waters has been an adventurous game for the sea farers. Or should they be called Sea Darers? The political ambitions and victories of the Political Masters must have created a smooth path for the Daring Merchants to lead the Economic Arena, and vice versa, the Merchants in strong positions for centuries must have created the smooth passage of friendly relations to political victories for the Ruling Clan. Because of their geographical locations and powerful naval forces, the two kingdoms already maintained significant control over key segments of Indian Ocean commerce during the eleventh century. The unprecedented naval conflicts between kingdoms in southern and southeastern Asia seem to have been a consequence of attempts by Chola traders and rulers to extend their sphere of influence into the coastal regions of China. pg. 73, The Military Campaigns of Rajendra Chola and the Chola-Srivijaya-China Triangle; Nagapattinam to Suvarnadwipa : Reflections on the Chola Naval Expeditions to Southeast Asia. The Cholas, through their inscriptions, not only recorded their achievements and victories over other kingdoms in land and across the seas, but also documented their style of administration, commerce, religion, culture, language and literature and more. They used their architecturally brilliant Temples to chronicle their history and geographic entities for future generations. The inscriptions on stone and copper plates prove significant evidences to their contemporary history and additionally and most importantly serve as linking chains to preceding and ensuing centuries and kingdoms alike. For knowledge of their military, administration and overseas commerce, the Chola documentation seems to have reached its pinnacle during the reign of Rajaraja I and his son Rajendra I. Both the Kings developed positive diplomatic and maritime trade relations with the kingdoms of South and Southeast Asia, and further expanded their strong military associations with the help of their valiant naval force and economic connections through well established Tamil Trader Guilds. Epigraphy is regarded the most reliable evidence to prove facts about kingdoms and their activities. 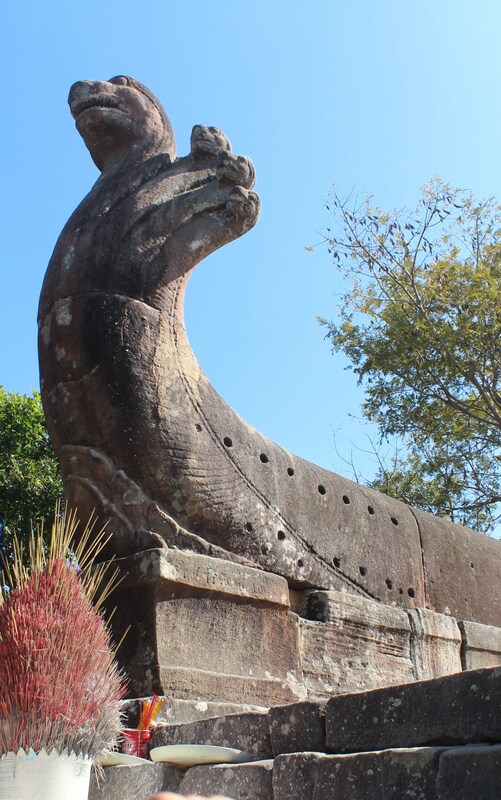 There is certainly a void left behind the history of sculpting Karaikkal Ammai in Cambodia and Thailand – void created due to absence of specific epigraphic evidences. 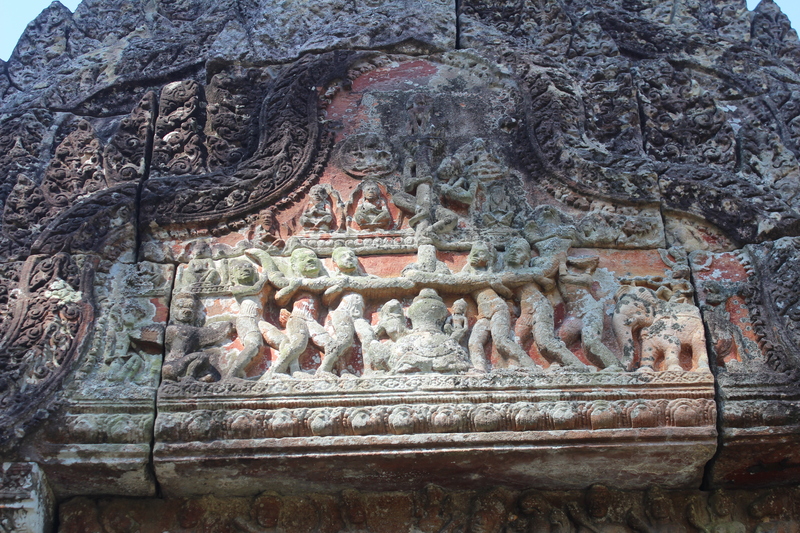 When there is absence of epigraphic clues on the sculpture of Karaikkal Ammai included in Khmer Architecture, the best option as per Finot is to decode the images; Decoding Images not only with the style of particular Kings but a comparative view of contemporary maritime kingdoms with the root of identical religious factors – in this case – Karaikkal Ammai. 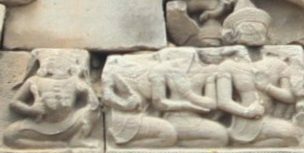 Now, with the absence of specific evidences that would provide clues to Ammai’s travel to Southeast Asia – specifically Cambodia and Thailand, it is important to explore different ways to decode the images of Ammai in 11th century Tamil and Khmer Kingdoms. The very few stone and copper plate inscriptions so far found in Tamil/Sanskrit languages in present day Tamilnadu, that mention the strong ties between the Tamils and Southeast Asian Kingdoms cannot be ignored here. These may not be direct epigraphic evidences to Ammai’s sculptural reference beyond high seas, but might provide a pathway to her explicit travel. The Pious Lady walked her way to Lord Shiva’s abode with her unparalleled faith in the Lord. The only thing she wanted was to watch her Almighty Dance to Glory. From each one of Ammai’s verses, the tear filled reader can feel the relentless Trust and spiritual Conviction of Ammai on Shiva – the Mystical Dancer. This Faith in the Mystical Dancer has elevated the Pioneer Tamil Saint of Indian Bhakti Movement way back in the 6th century ACE to more than an Ambassador of the Shaivite Movement spreading the wave of Adalvallan/Dancing Shiva towards Southeast Asia. Nearly four centuries after Ammai’s life, the Temple Builders gave the Eternal Devotee a sculptural identity even beyond high seas, and amazingly the same way she had wanted to remain. A few important flash points during the reigns of Rajaraja I and his son Rajendra I in Thamizhagam, during the years 985 ACE – 1050 ACE, which coincides with the reign of Suryavarman I in present day Cambodia (1010 ACE) and north-east Thailand might provide important clues on the strong connections between both states. These flash points with the available inscriptions are strong evidences of the influence the Tamils had on the economy, culture and religion of the Khmer Empire. 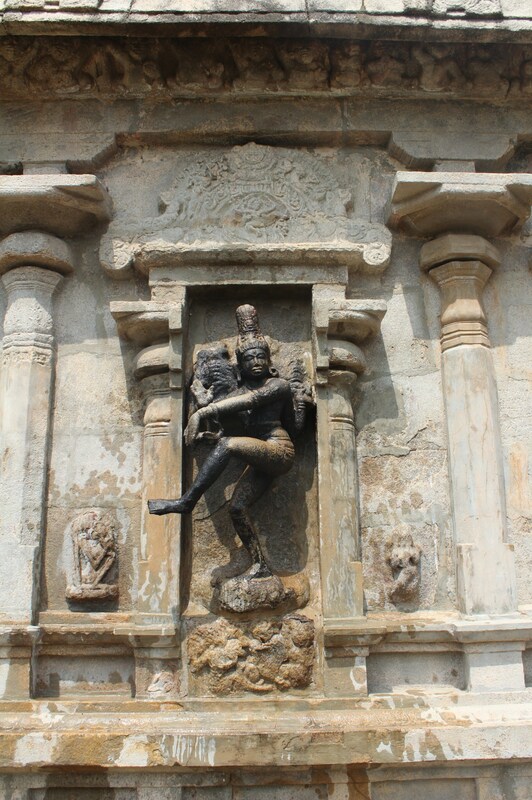 The impact of the stronghold of the Tamils can be visible through sculptures in their temples and temple architecture. 985 ACE – Rajaraja I ascends the throne as Chola King after Madhurantaka Chola. 2. 1006 ACE – Rajaraja’s Larger Leiden Copper Plate Inscription. The Inscription dated in the 21st regnal year of the King was posthumously added by his son Rajendra I.
a. Completion of Thanjavur Temple – a mile stone in Chola Temple Architecture. With their economic ties at peak, the Cholas demonstrated their architectural excellence through Thanjavur Periya Kovil. 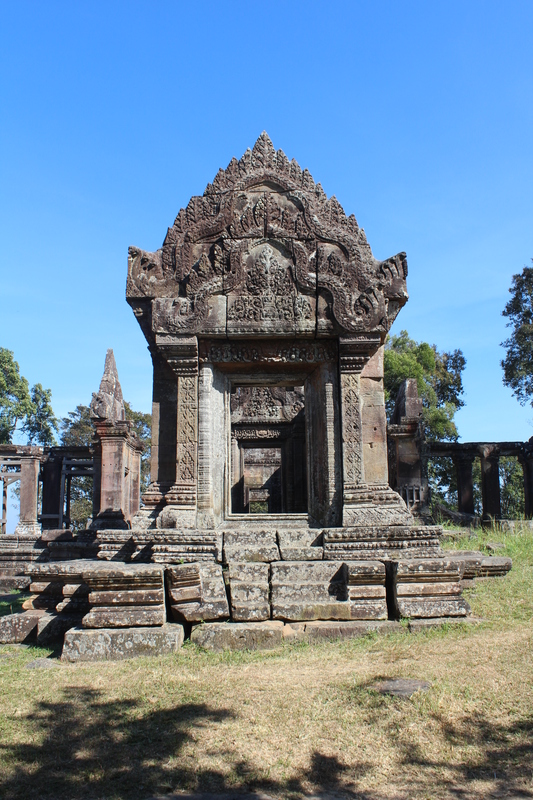 Before the Cholas, the kingdoms in today’s Vietnam, Cambodia, Laos, Myanmar, Thailand and Indonesia were already influenced by religion and temple architecture from Indian kingdoms and specifically showcase impressions of Pallava Architecture in their temples. Rajaraja projects himself and the Cholas as a friendly yet strong economic power. The already well settled Tamil Merchant Guilds abroad seem to have bloomed suddenly with confidence due to Political Amicability between the Cholas and the host kingdoms of the Guilds. b. 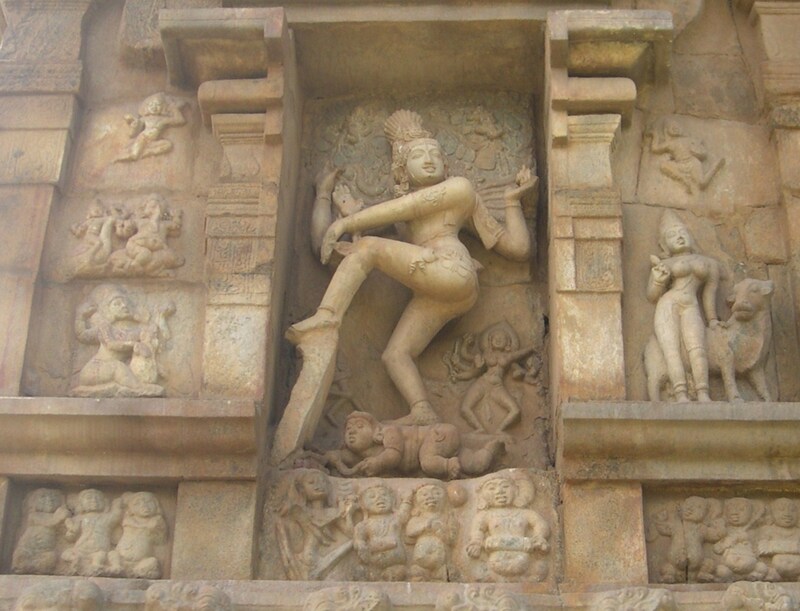 Portrayal of Dancing Shiva in Rajaraja’s Magnum Opus – The Emperor doesn’t forget his grandmother Chembiyan Madevi’s introduction of Karaikkal Ammai at the feet of Adalvallan. 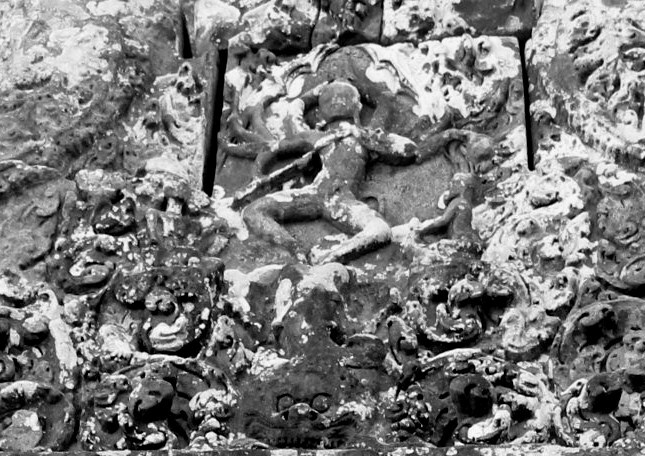 He places her watching the Divine Dance to the left of Shiva, somewhat similar to Madevi’s sculptural depiction, in a panel close to the central niche of Dancing Shiva. 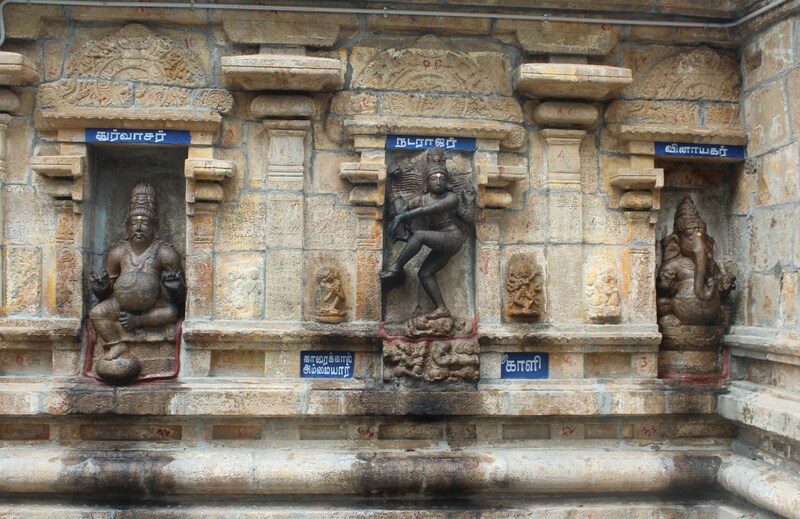 It is also note worthy to mention that Madevi had experimented the portrayal of Ammai in various ways – mostly to the right of Shiva in a separate panel close to the niche placing Adalvallan (Koogur Mampazhamudaiyar – sanskritized name: Ambaravaneswarar temple), with an exotic instrument sirattai kinnari (Thiruppugalur Konapiran – sanskritized name: Vardhamaaneeswarar temple) or at the feet of Shiva among various instrumentalists (exclusive panel of Karunthittaikudi – sanskritized name: Vasishteeswarar temple), etc. 4. 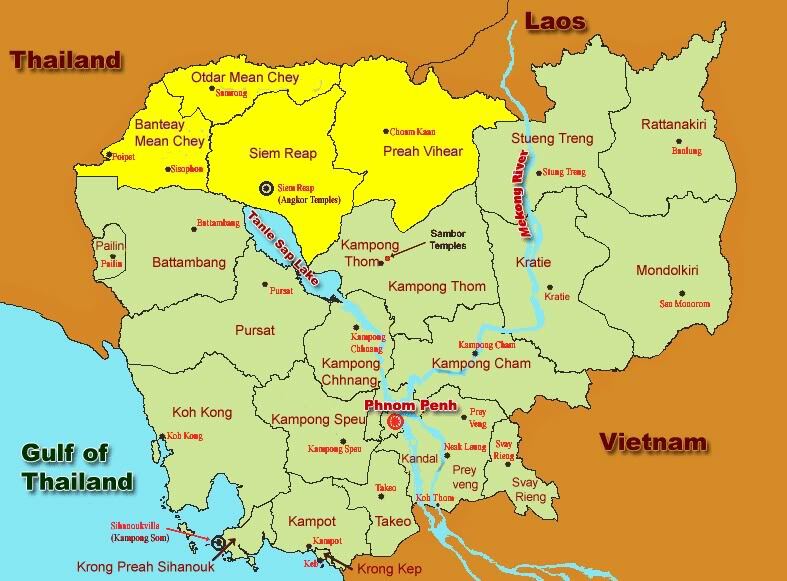 1010 ACE – Suryavarman I claims Khmer throne after years of turmoil. 5. 1014 ACE – Rajendra I, son of Rajaraja I comes to power after demise of father. Rajaraja’s Larger Leiden Plates of 1006 and Rajendra’s 1014, 1015 and 1019 inscriptions of Nagapattinam show the cordial connect between Cholas and Srivijaya. The available inscriptions co-incidentally talk religion on a mutual tone. 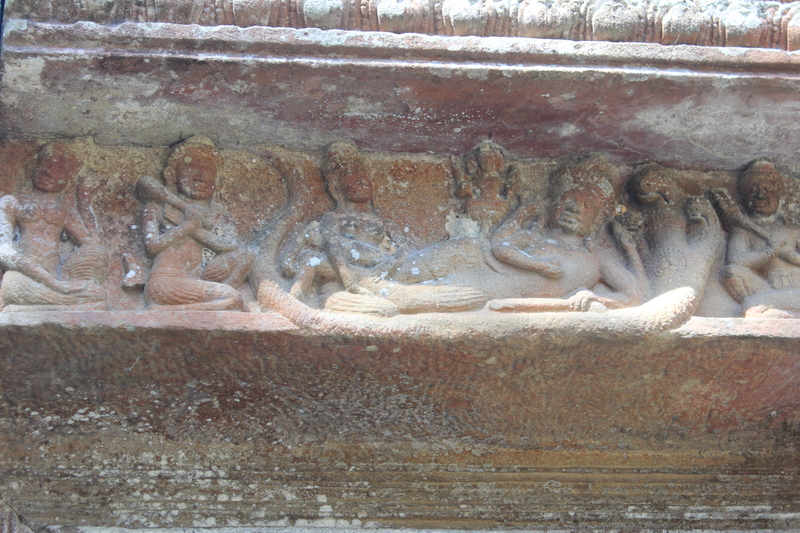 While Rajaraja grants a village for a Buddhist Vihara for Srivijaya, the agents of Srivijaya provide grants for Hindu temples in Chola country. The entangled Religion factor alongside Mercantile is certainly not to be ignored. The growing power of the Cholas – economically and politically has been recognized by their strong competitors in the Indian Ocean – the Srivijaya. The above mentioned inscriptions which talk of their grants show their desire for cordial relations through their agents in Tamil Land. Other epigraphical evidences reveal the unambiguous rise of the Cholas as Maritime Champions during the reigns of Rajaraja and his son Rajendra. Rajaraja I conquered the Cheras, Pandyas, Vengi, Gangapadi, Tadigaipadi, Nolambapadi and parts of Andhra Pradesh, Srilanka, Maldives and many more. Alongside successful conquests of Kingdoms, Rajaraja followed friendly diplomacy towards his Southeast Asian neighbors across high seas. 9. 1027 ACE – Thirukkadaiyur Inscription of Rajendra I – Rajendra Chola initially continues father’s policy of amicable relations with the Southeast Asian Kingdoms and also reconfirms Rajaraja’s grant to the Buddhist Vihara in Nagapattinam. There seems to be a sudden deviation in the friendly strategy in 1017, which erupts in 1025 into the largest ever sea battle undertaken by any Indian King as on date, under Rajendra I. His Thirukkadaiyur Inscription lists his conquests and victories across the rolling sea. [Rajendra Chola] having despatched many ships in the midst of the rolling sea and having caught Sangrāma- vijayottunga-varman, the King of Kadaram [Kedah, Malay Peninsula], together with the elephants in his glorious army, (took) the large heap of treasures, which (that king) had rightfully accumulated; (captured) with noise the (arch called) Vidhyādhara-torana at the ‘war-gate’ of his extensive city; Śrī Vijāya [Palembang] with the ‘jewelled wicket-gate’ adorned with great splendour and the ‘gate of large jewels’; Pannai [east cost of Sumatra] with water in the bathing ghats; the ancient Malaiyur [Jambi, Sumatra] with the strong mountain for its rampart; Māyuridingam [Malay Peninsula] surrounded by the deep sea as by a moat; Ilangāśoka [Langkasuka, Malay Peninsula] undaunted in fierce battles; Māpappālam [near Pegu, Burma] having abundant water as defence; Mevilimbangam [near Ligor, south Thailand] having fine walls as defence; Valaippanduru [perhaps Panduranga, central Vietnam] having Vilappanduru(? ); Talaittakkolam [at the Isthmus of Kra, southern Thailand) praised by great men (versed in) the sciences; Mādamālingam [Lamuri, north Sumatra]; Ilāmurideśam [Tambralingam, east coast of Malay Peninsula], whose fierce strength rose in war; Mānakkavāram [Nicobar Islands] in whose extensive flower gardens honey was collected; and Kadāram of fierce strength which was protected by the deep sea. page 2, Tansen Sen’s View by Hermann Kulke, The Naval Expeditions of the Cholas in the context of Asian History; Nagapattinam to Suvarnadwipa. If Trade and holding Power of Trade Routes have been reasons behind Rajendra’s Srivijaya attack, the rise of Cholas from a friendly economy to a powerful naval force must have invoked changes in the mindset of the Kingdoms nearby. 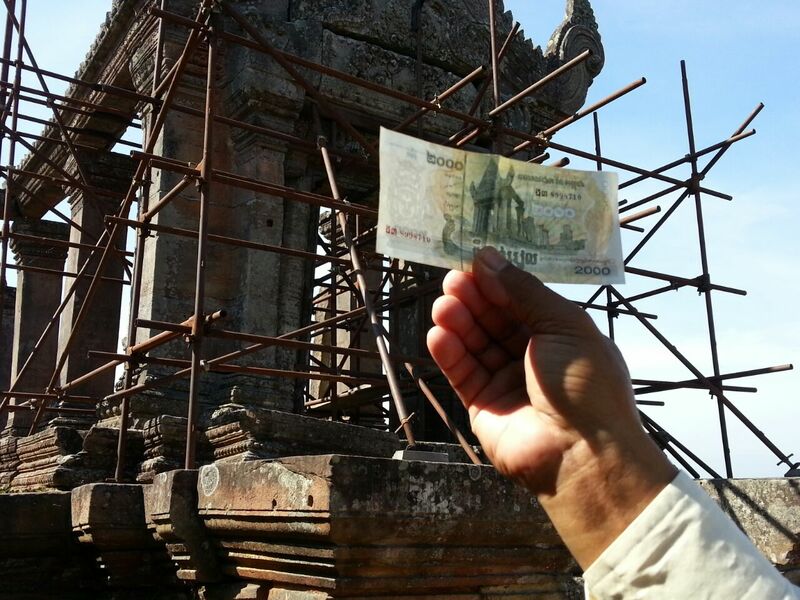 One of those was the Khmer Kingdom. pg.3, Hermann Kulke, The Naval Expeditions of the Cholas in the context of Asian History; Nagapattinam to Suvarnadwipa. 10. 1020 ACE – Karandai Copper Plate Inscription of Rajendra I – refers to the chariot presented by a Kamboja King to Rajendra, inorder to protect his sovereignty. 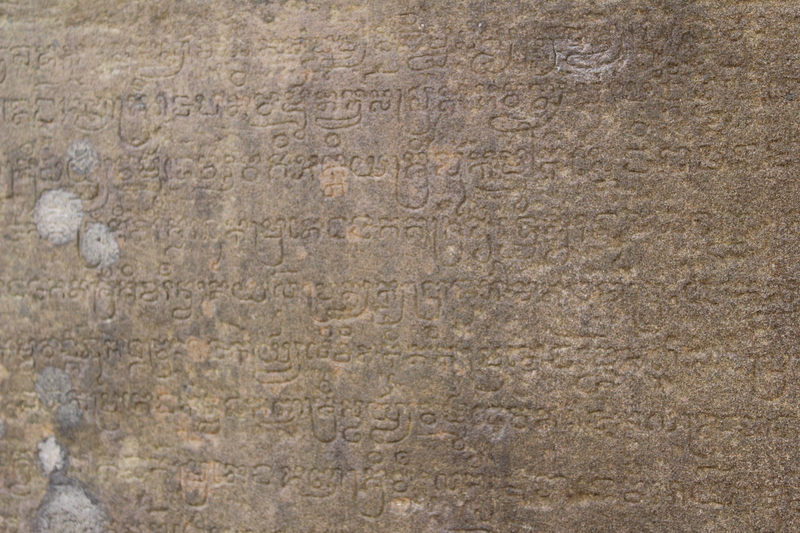 This inscription is one direct connect between Tamil and Khmer Empires. It doesn’t show any religious correspondence as mentioned in Nagapattinam Inscriptions with regards to Srivijaya. Yet, this is a remarkable evidence of Trade Wars leading to Military Conquests, thereby emphasizing the Chola Influence on other Southeast Asian Kingdoms. Though all the previously mentioned inscriptions have been translated, discussed and analyzed by various respectable researchers, they have been repetitively mentioned by this writer to re-emphasize the Power of the Chola Naval Forces which was its zenith in the 11th century ACE, which in turn led to successful maritime trade activities through Tamil Merchant Guilds in the Southeast Asian kingdoms and as far as China. The success in military raids and maritime trade links across the Indian Ocean, cutting across the Straits of Malacca and reaching the Song Dynasty of China, is another way of giving prominent stature to the Tamil Merchant Guilds in the raided countries and neighboring kingdoms alike. While we talk about the Tamil Merchant Guilds called ‘Manigramam’ present in the Southeast Asian Kingdoms during the Chola reign, it is important to mention the Takuapa Tamil Inscription. The Takuapa Tamil Inscription is the first available epigraphical evidence of Tamil Trader Settlement in Southeast Asia written in Tamil Language. The early ninth century ACE inscription mentions ‘Sri Avani Naranam’ – the title of the Pallava King Nandivarman III, who ruled from Kanchipuram in Thamizhagam from 826 ACE to 850 ACE. What lies beneath and above the evidences on Tamil Merchant activities, is the religious string always clinging on to Trader Guilds. 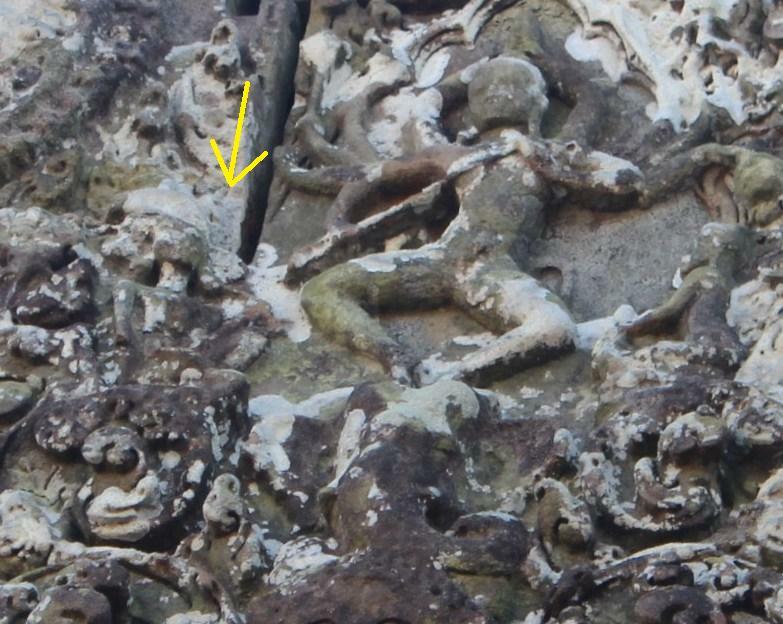 Takuapa, on the west coast of Malay Peninsula has left behind Hindu sculptures in Pallava style. The main deity that was believed to be Vishnu has been suggested by Prof. Sastri in his revised article in the Journal of Oriental Research as Shiva in Gangadhara form with Bhagiratha on his right and Parvathi to his left. He also mentions that Dr. Wales had assessed the date of the images to be between 7th and 8th century ACE. The most important fact to be noted here too is the religious link alongside the trade link. The traders settled in several parts of various kingdoms across Southeast Asia, created their own religious entities to stay connected to their roots. With or without pre-planned motive on spreading the influence of their language, culture and religion in the country of their settlement, there has been undoubted influence of the Tamil Religious Cult that traveled with the trade wave. Trying to place Karaikkal Ammai in the religious interest of Trader Guilds, the foremost reason to have brought her into Southeast Asia could be because of the community she originally belonged to. Hailing from Karaikkal, the port town of yesteryear Pallava country which later came under the Cholas, Ammai belonged to the Trader Community. 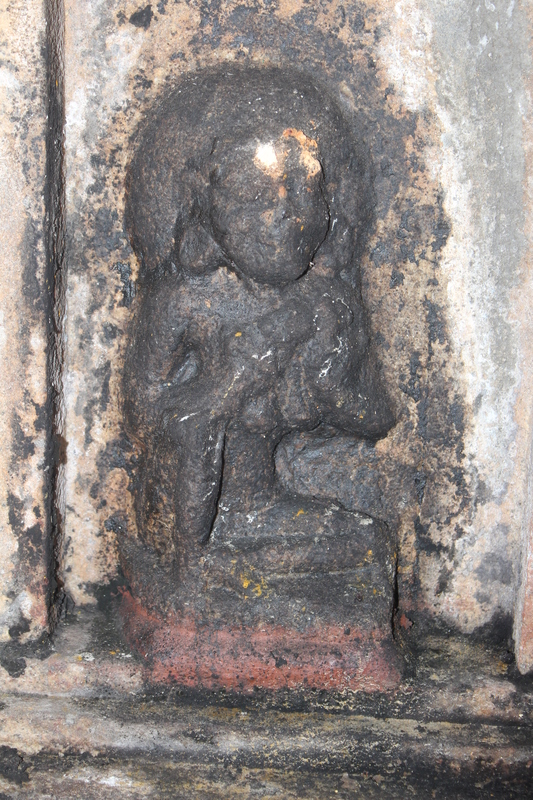 As mentioned in previous posts, the sculpting of Ammai in Tamil Temples was pioneered by Chembian Madevi in the 10th century ACE. 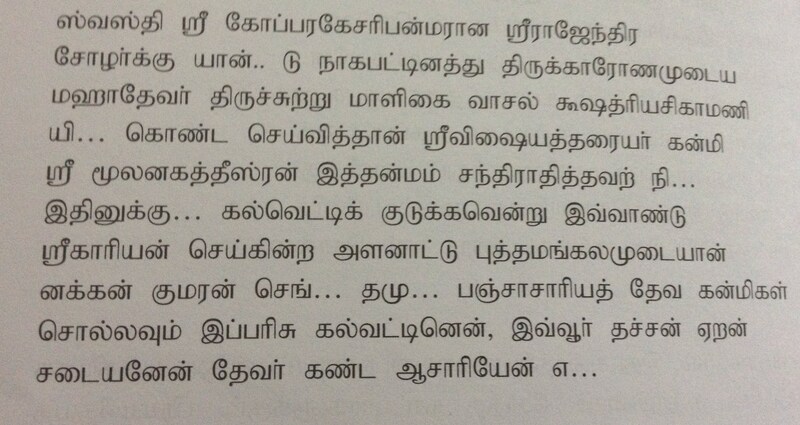 Yet, the devotional verses of Tamil Nayanmars on Shiva have been popular among Tamils throughout previous centuries. The vigour to place Shavisim beyond other rival beliefs as Buddhism, Jainism and even Vaishnavism (different sect within Hinduism) has always yielded success through the spread of the divine verses of the prominent three Nayanmars as well as the stories of 60 other Nayanmars and their love for Lord Shiva, before Chekkizhar could create their stories in verses in Periya Puranam, in the 12th century ACE. There is no clear evidence to prove the spread of the verses of Karaikkal Ammai, which sees Shiva as the Mystic Dancer. Her verses are not for the ordinary Devotee. Strong verses immersed in the ashes of the Cemetery, seeing herself as the skeletal ghost and calling herself the Demon of Karaikkal are exclusive features of Ammai’s Devotion. Reading her poetry, one might feel that the story of Ammai is better comprehensible than her verses, because of the Mystical Spritualism that she portrays. An explicit story, aloof from the rest of world and even beyond, seeking removal of worldly beauty and earthy desires, and even more – a Desire to watch the Dance of the Eternal Dancer should’ve been the story of households trying to preach Shaivism to the next generation as well as to protect from other religious beliefs. The verses of Thirunavukkarasar, Sambandhar and Sundarar – the foremost saints of Tamil Bhakti Movement were and still are rendered in Temples to praise the glory of the Lord. But, the story of Ammai is a life portrayal of Devotion to be narrated by word of mouth. 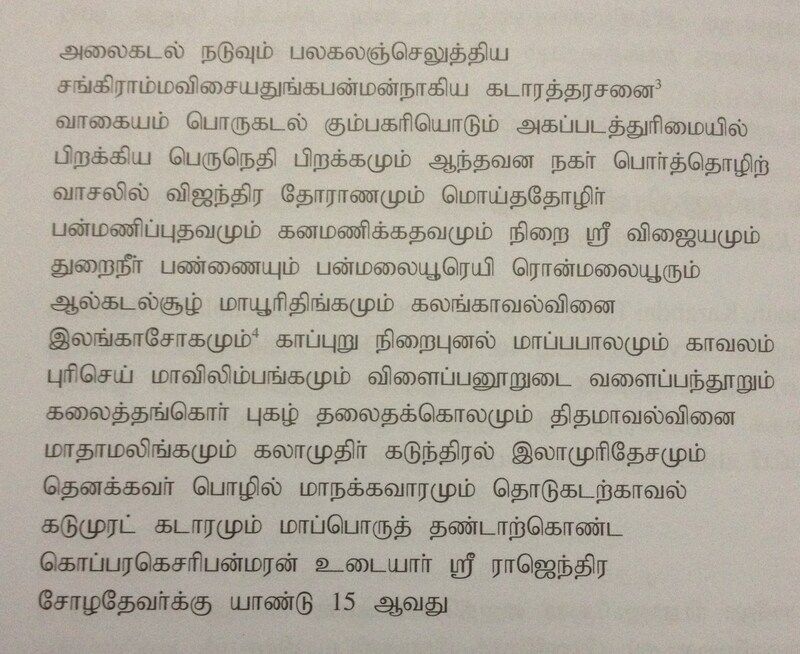 The Takuapa Tamil Inscription that mentions Avaninaranam is another link to Thevaram verses sung in Temples. It was seen before that Avaninaranam was one of the titles of the Pallava King Nandivarman III. The Thiruvallam Inscription of 852 ACE, as classified by S.R. Balasubramanyam, refers to grants offered to singers of Thiruppathiyam in the temple of Thiruvallam devoted to Lord Shiva. Thiruppathiyam refers to Thevaram hymns. 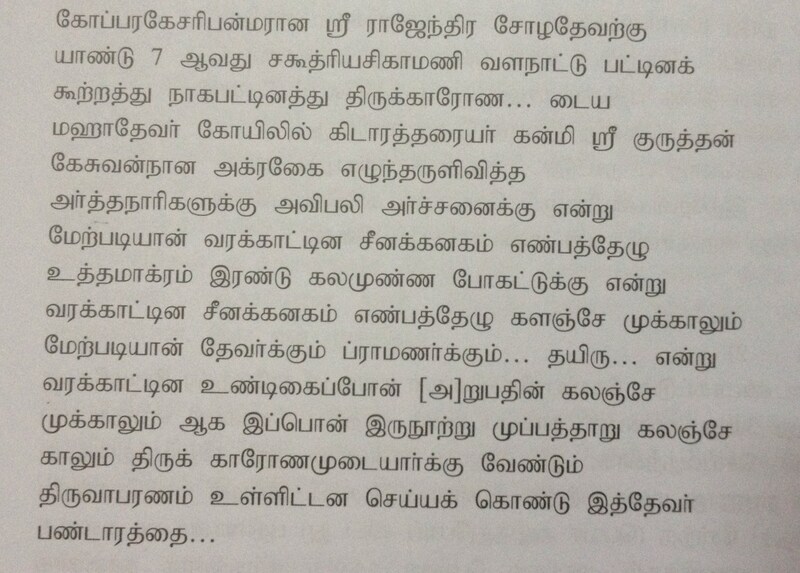 Thiruppathigam mentioned here, could be those of the Supreme Trio of Tamil Shaivic Movement. If the hymns of the Shaivite Trio had been popular among temple goers and society as a whole, with singers employed in the temples as early as Pallava rule, the spread of the stories of Nayanmars couldn’t be behind. The fact to be noted here is the importance given to the Pioneers of Shaiva Bhakti Movement, in keeping Shaivism intact among the members of the society. Preaching Shaivism through Nayanmars as Religious Trendsetters has been a continuous trend among the Rulers and their Spiritual Advisors. This again showcases the importance given to Nayanmars in temples, to emphasize Shaivism among the population. Hence, the stories of the simple saints of Shiva formed an integral part of Religion and Religious Belief since the Pallavas. This remains proof to yet another fact that the portrayal of these poets in stone comes far later as after centuries of their deeds, but the spread of Shaivism through their lives has been a continuous affair through Temple recitals and word of mouth. Kingdoms were no different to this scenario. Most of the Nayanmars who lived before the Victory of Cholas in the 9th century ACE, in different kingdoms of southern India, seem to have glided into the religious lives of the Tamils irrespective of the kingdoms they belonged to. Tamil – the language and Shiva – the Lord were the only main connecting factors. The already well known stories and hymns of the Nayanmars made the Chola Queen Chembiyan Madevi portray the Pioneer Saints in Sculpture. It is to be understood that the Tamils living in Tamil Land or the Tamils migrated to foreign lands for Trade purposes carried their religious identity as part of the roots left behind. 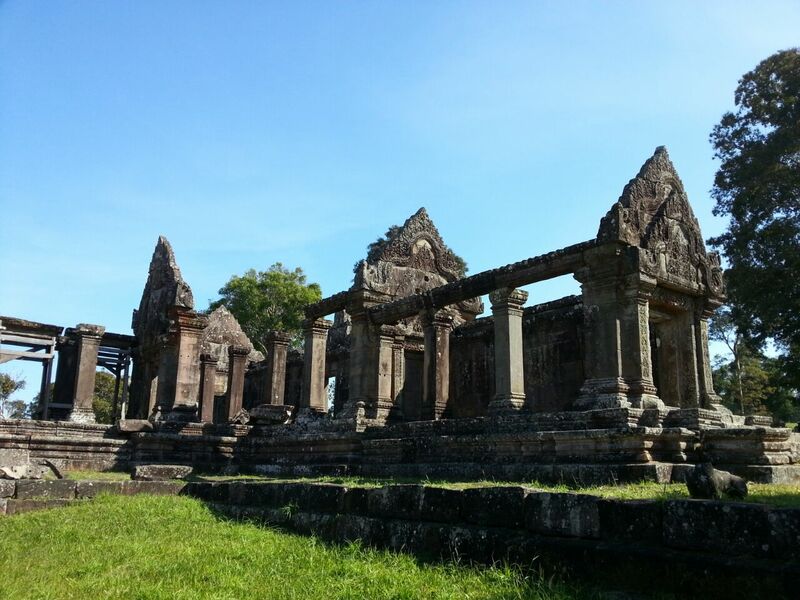 Hence, we see Shaivism prominent in the Trader Settlements through their inscriptions and the Religious Sculptures discovered all along Southeast Asian countries. If Thirunavukkarasar, Thirignanasambandhar and Sundaramoorthy Nayanar form the three Primary Saints of Tamil Bhakti Movement, why was Karaikkal Ammai the first Tamil Saint to travel abroad seaways? The Traders Settlement in Southeast Asian Kingdoms, lived their lives for centuries with the stern Shaivite identity through belief in Shiva and his Devotees – the Nayanmars. We see the same culture till today. The immigrant communities trying to stick to roots through Religion is the norm of all ages. Even in Takuapa we find idols of Hindu Gods as evidences of Temple and Worship among the Dwellers.The spread of Shaivism received a strong pathway through the spread of devotional stories among the immigrant Tamil Trade Settlers to stay rooted. With the unexpected uprising of the friendly Cholas as a Strong Military among the Kingdoms along the Indian Ocean and Malay Peninsula, the Merchant Guilds could’ve found sudden and increasingly positive ties in the places of their overseas settlement. As quoted by Hermann Kulke, Meera Abraham’s view on Rajendra’s Raids on Srivijaya from her book ‘Two Medieval Merchant Guilds of South India’ is to be seen in light of the above mentioned reflection. pg. 15, M. Abraham’s view by Hermann Kulke, The Naval Expeditions of the Cholas in the context of Asian History; Nagapattinam to Suvarnadwipa. Here, Ms. Abraham emphasizes a direct influence of the famous Manigramam and Ayyavole merchant guilds on the politics of the Cholas. This is yet again proof to the intertwined connect of the Merchant Guilds and the Political Masters. 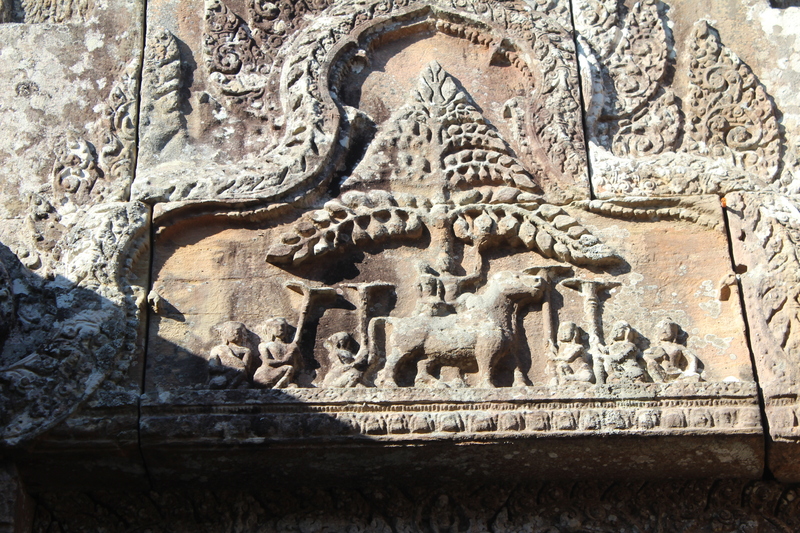 With Rajendra’s raids, and Khmer King Suryavarman I (who comes to power in 1010 and sends a chariot to Rajendra in 1020) extending friendly hand, with expectations of amicable reciprocity from the Tamil country, the Tamil Trader Community could’ve found a right time to represent their identity in Khmer country through the sculpture of Ammai, who belonged to their own community back in Tamizhagam. The reason behind why the Shaivite Trio – Appar, Sambandhar and Sundarar couldn’t find their first place in Southeast Asian Temples and Karaikkal Ammai takes the first entry could also be the same. Traders have always proved to be Religious Diplomats. Their potential in elevating a kingdoms/country’s Economy has been seen to have placed them among the Elites. 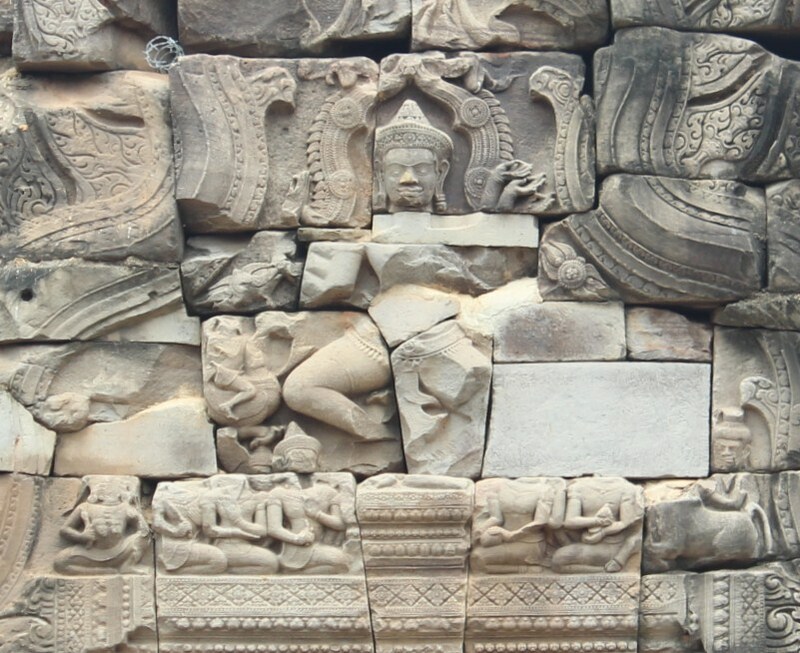 These Diplomats along with the Spiritual Advisors of the Khmer Kings could have successfully elevated the devotion of Ammai to a new personification in Khmer Temple Architecture. Hence, Suryavarman I adopting the sculptural portrayal of Karaikkal Ammai in the temples built and renovated by him, could have been the retrospective effect of the raids of Rajendra I and the new energy pumped into the Tamil Merchant Guilds of the Khmer Empire. One can also notice the fact that Rajaraja’s Karaikkal Ammai is placed almost the same as Chembian Madevi’s style of sculptural portrayal. Rajendra makes a change in his Gangaikonda Cholapuram Ammai. 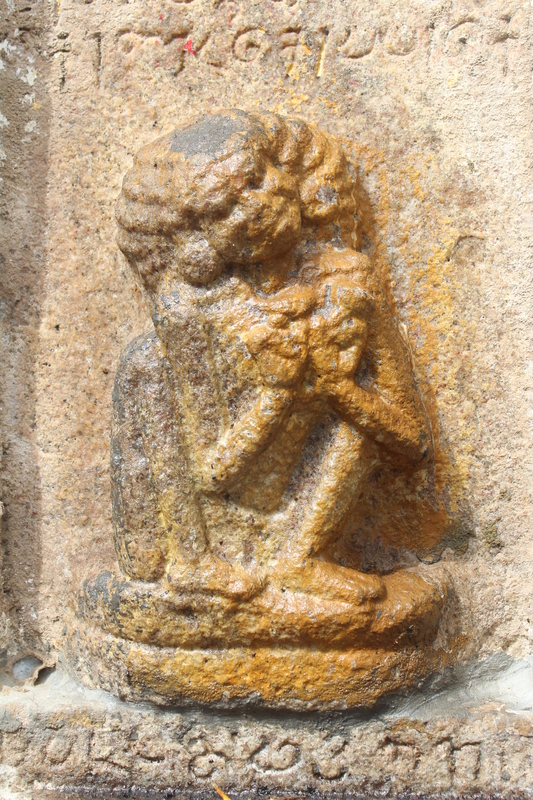 She is not sculpted to the side of the Dancing Lord, but seen sitting among a separate panel of instrumentalists below Him. 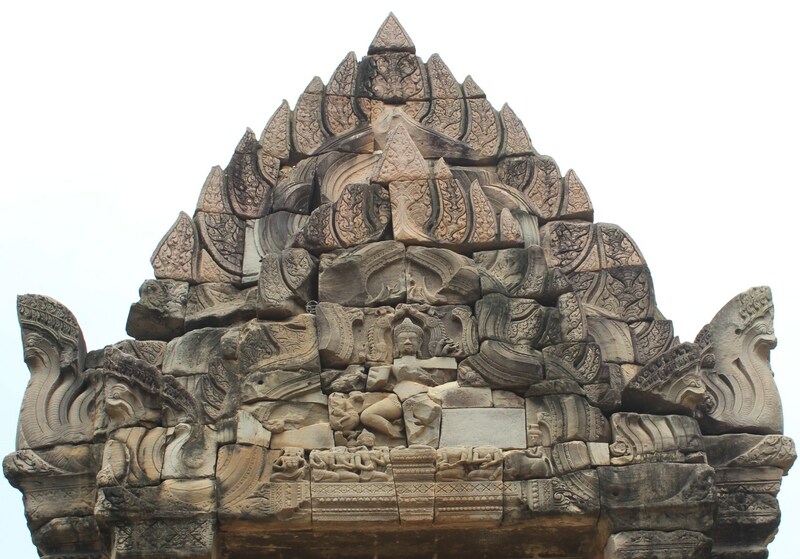 In portraying Karaikkal Ammai in their Temples, the Khmers seem to have adapted the similar pattern of Rajendra I. Then, is this yet another clue to the introduction of Ammai by Suryavarman I ? Karaikkal Ammai sculpted in Khmer Temples in north-east Thailand would be seen in the next post. Tansen Sen, The Military Campaigns of Rajendra Chola and the Chola-Srivijaya-China Triangle; Nagapattinam to Suvarnadwipa : Reflections on the Chola Naval Expeditions to Southeast Asia. Noboru Karashima and Y. Subbarayalu, Ancient and Medieval Tamil and Sanskrit Inscriptions Relating to Southeast Asia and China; Nagapattinam to Suvarnadwipa : Reflections on the Chola Naval Expeditions to Southeast Asia. Hermann Kulke, The Naval Expeditions of the Cholas in the context of Asian History; Nagapattinam to Suvarnadwipa : Reflections on the Chola Naval Expeditions to Southeast Asia. KA. 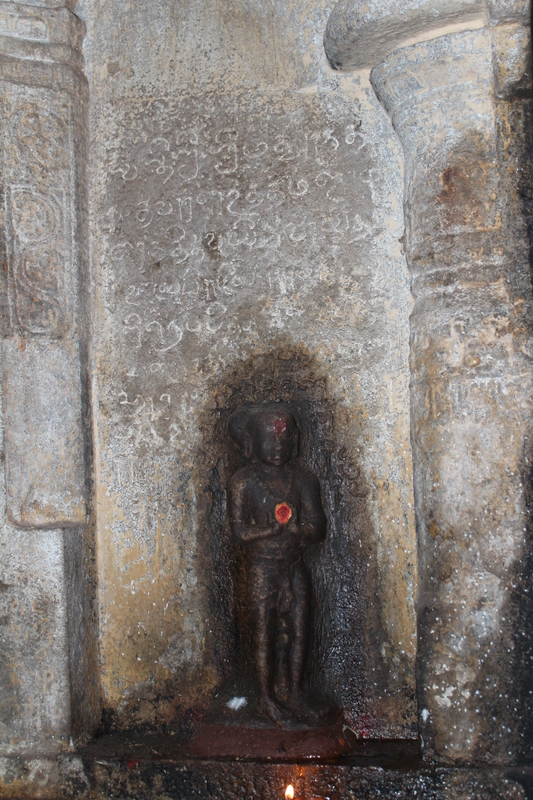 Nilakanta Sastri, Takuapa and its Tamil Inscription. Karen Pechilis Prentiss, The Embodiment of Bhakti. The Sculptures of Karaikkal Ammai with picture perfect iconography in Cambodia and Thailand should inspire researchers to explore more on the Tamil Links with South East Asia. Hence, the places in Medieval Thamizhagam, where the patronisation of the saint started in stone could form the CORE CHARACTER of any analytical study and certainly is fundamental for any such research. 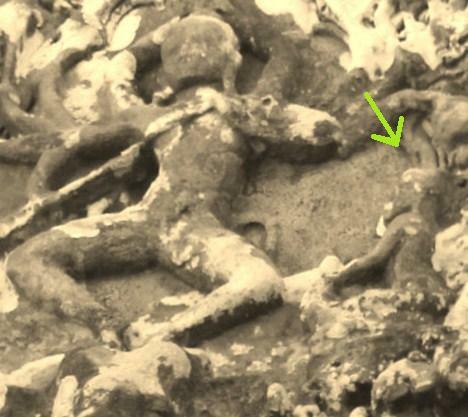 As per available iconographic evidences, Karaikkal Ammai, the pioneer saint of the Bhakti Movement in India who lived in the 5th/6th century ACE during the reign of Pallavas seems to have been sculpted for the very first time in Shiva Temples built by the Chola Kings. The first Chola Royalty to have brought Karaikkal Ammai in temple sculptures is Chembiyan Madevi, the consort of Gandaraditha Cholan, who ruled the Chola country for a very short period from 950 ACE to 957 ACE. After defeating the Pallavas, Cholas claimed power over the lands of Thamizhagam with Vijayalaya Chola in mid 9th Century AD, followed by Aditya and Paranthaka who built temples at their creative best. After Paranthaka, there was a slight deviation towards Devotion over aspirations of conquest and thirst of power. Gandarathitha. son of Paranthaka I who came to power next was a staunch devotee of Shiva more than an ambitious King. His wife Chembiyan Madevi was a true consort to his likes of Devotion. Gandarathitha an ardent Shiva Devotee himself, has sung hymns on the Lord and his hymn is included in the 9th Thirumurai. While Gandarathitha died at an early age with his son still very young, Arinjaya his brother ascended the throne. After the death of her husband Gandarathitha, Chembiyan Madevi devoted her life for the cause of Devotion to Lord Shiva and stood up as a Majestic Lady hailed for building numerous Shiva Temples during the second half of 10th century ACE. Her valid contributions to the welfare of villagers and upbringing of culturally-religiously oriented Chola Off-springs still remain distinctly unrecognized, yet documented well in inscriptions. 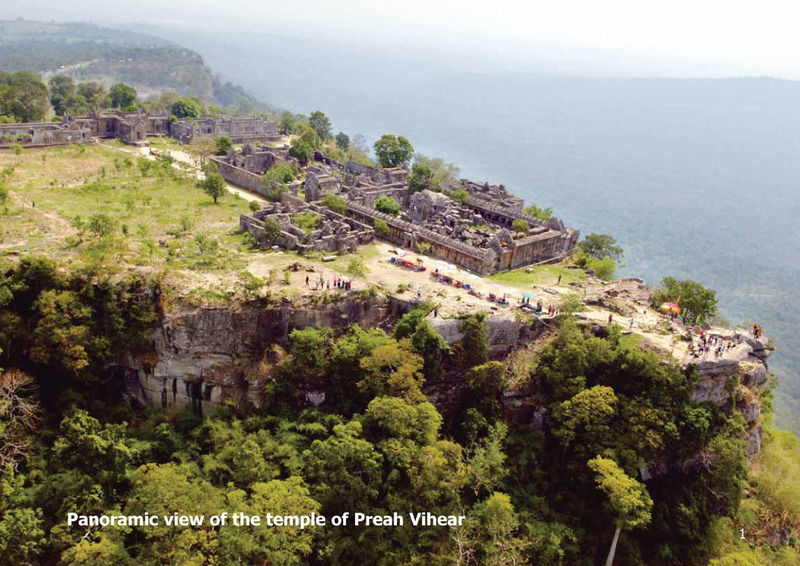 To simply mention that Chembian Madevi built many temples during her life-time would be a thorough under statement of her Pioneering Abilities. Madeviyar has a long list of innovations and initiatives to her credit, in making the Chola temples more diverse – through design changes in temple architecture like increasing the number of Niches, which seem to be minimalistic until her father-in-law Paranthaka’s period. Losing her husband at a very early age, with a young son still not ready to attain the throne of Chola Empire, this strong hearted Lady of Tamil Civilization diverted and focused her concentration on religious activities. Madevi has always been a major donor to temples even during Paranthaka’s reign, as a crown princess and also during her husband’s reign. Not succumbing to her personal losses, she rose up as a truly brave soul and a remarkably respectful character in the Tamil Bhakti Sphere, through her amazing Will to rewrite Culture, Religion and Diversify Temple Architecture through Temples built during her long octogenarian life time. This certainly can be termed as the Pinnacle Achievement of the Grand Old Lady, who lived to see six successful Emperors of her Land, the Chola Territory. Indeed, very true – married at a very early age and becoming part of Chola Empire, the daughter-in-law of King Paranthaka Chola, Chembiyan Madevi has had the unique life of experiencing and cherishing the Chola Supremacy during the rule of six Emperors. She lived a highly deferential life as a guiding force for 5 Kings of Chola Empire starting from her husband Gandarathitha’s rule. Chembian Madevi – the Grand Old Lady of the Chola Empire- is of utmost importance for any research on Karaikkal Ammai. This is precisely because she seems to be the Pioneer Queen to have ordered sculptural representation of Karaikkal Ammai in most of the Shiva Temples she built and those brick temples she renovated in stone. The life of the Skeletal Mother of the Tamil Bhakti Movement, must have left such a deep impact on the Queen, that Chembiyan Madevi makes Ammai’s presence as per Ammai’s wish – sitting below the dancing feet of Adalvallan – Nataraja, mesmerized in his cosmic dance. The undeciphered connect of these two Pioneers in their own respects – Madevi and Ammai, between 6th century ACE and 10th century ACE can be strongly felt in the temples. The eternal wish of a mother emotionally accepted and appreciated by another mother, and interpreted in stone- but after an interval of about 400 years in history. Truly Amazing isn’t it? The temples built by Chembian Madevi around present day Thiruchirapalli, Thanjavur, and Nagapattinam districts in Tamilnadu stand testimony to the involvement of Chembiyan Madevi in glorifying eternally the Aura of Karaikkal Ammai. I had the great honour of getting unparalleled guidance from Dr. R. Kalaikkovan, Founder, Dr. Rajamanickanar Historical Research Centre regarding Karaikkal Ammai sculptures in Tamilnadu, Chembiyan Madevi Temples, glimpses of Chola Temple Architecture, Inscriptions, Social Aspects that are preserved and revealed through temples and many more. Achieving the Tamilnadu Government Prize for his first research book ‘KALAI VALARTHA THIRUKKOVILGAL’ published in 1985, Dr. Kalaikkovan has won several laurels for his contributions towards Historical Research. His relentless interest in exploring History through Temples has lead to the finding of several unique sculptures, paintings and inscriptions in the temples of Tamilnadu. His Centre has been publishing its annual research magazine ‘VARALARU’ since 1983.
changing the already existing negative view on Kalabhra time as the Dark Era of Tamil History through inscriptions, literature and historic evidences. 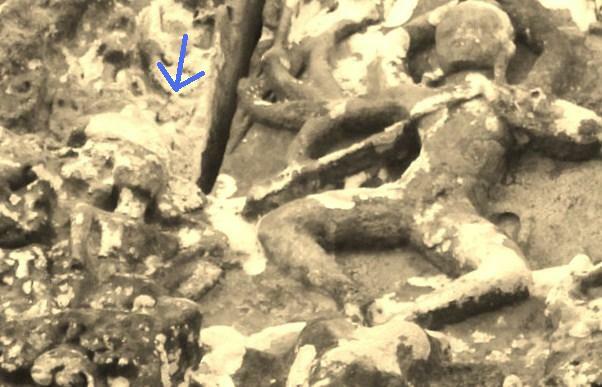 Dr. Kalaikkovan mentioned during his travel (in November 2013) to Banteay Srei Temple, Cambodia that the skeletal figure found below Dancing Shiva was Karaikkal Ammai. 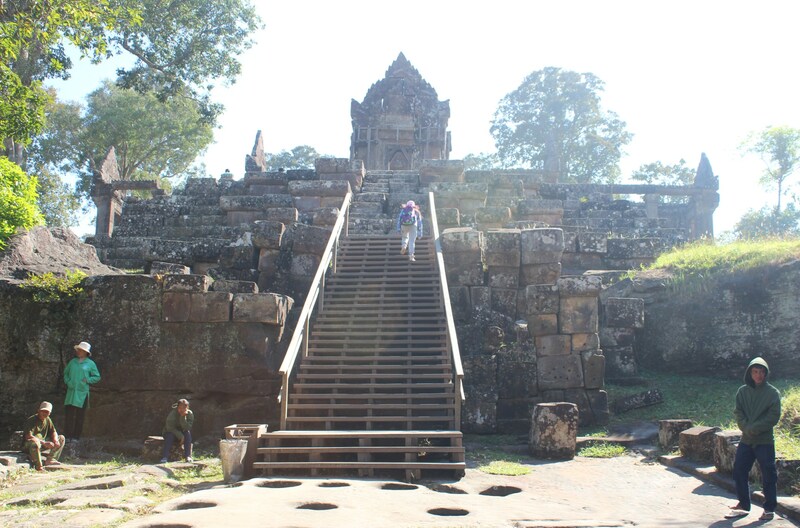 He explained about the Iconography of Ammai and how Angkorian temples possessed the perfect iconography. 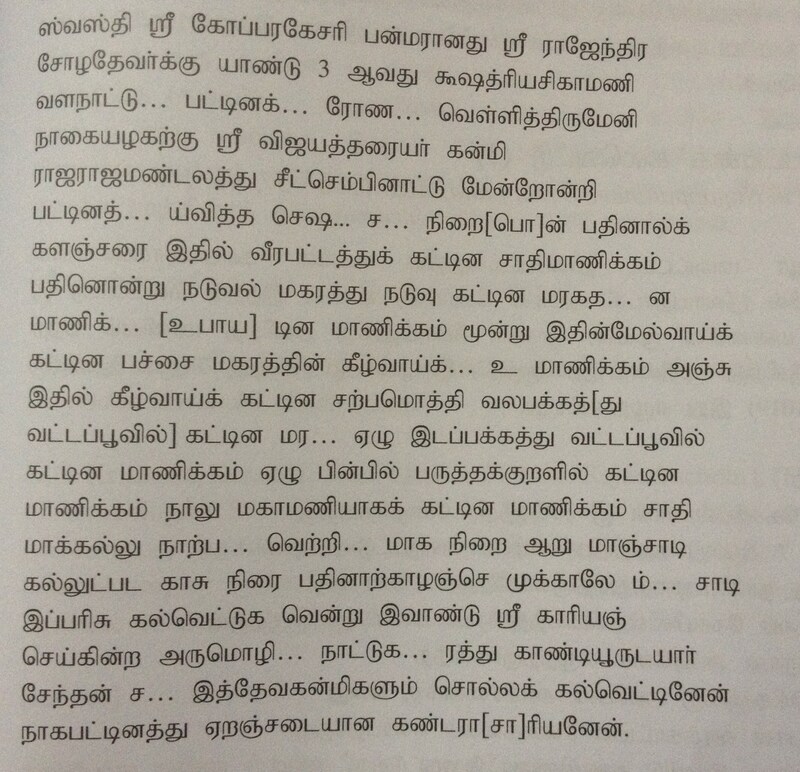 This introduction of Ammai in Cambodia by Dr. Kalaikkovan is the root cause of my interest in Ammai and the Tamil Connections in South-east Asia. Furthermore, through Ammai, the epitome of Devotion, he has also introduced me to another Ammai, Chembian Madevi, the epitome of Early Chola Culture and Religion. Thereafter, he also enlightened me on the temples of Chembiyan Madevi and her Devotion towards Shiva; Adding that the temples with the first sculptures of Karaikkal Ammai in Tamizhagam were constructed by Chembiyan Madevi. A visit to Tiruchirapalli and field work with the great scholar has filled me with basic knowledge about those beautifully sculpted, magnificently erected temples which are store houses of the glorious history and wonderful documental evidences of social life of Tamils in the past. A long list of the Pioneering Activities of Madevi has been my coveted collection from Dr. Kalaikkovan. 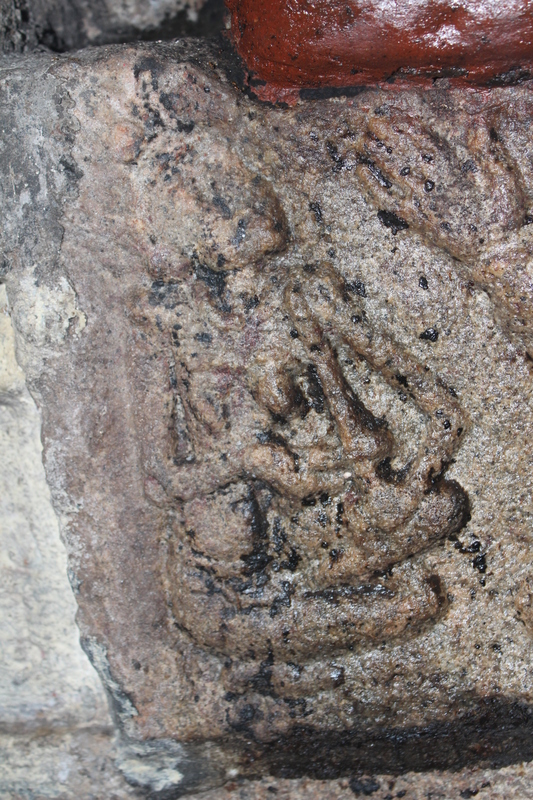 As mentioned above, she bears the exclusive specialty of introducing Karaikkal Ammai in Stone Sculptures in her temples. Apart from this ‘Launch’, which is of great importance to our research on Ammai, Chembian Madevi has carved her own Niche in breaking new grounds in Dravidian Temple Architecture. Madevi has many ‘first-times’ to her Innovations List. The first Royal Administrator (Administrator of Temples) to bring in Karaikkal Ammai in her stone sculptures. 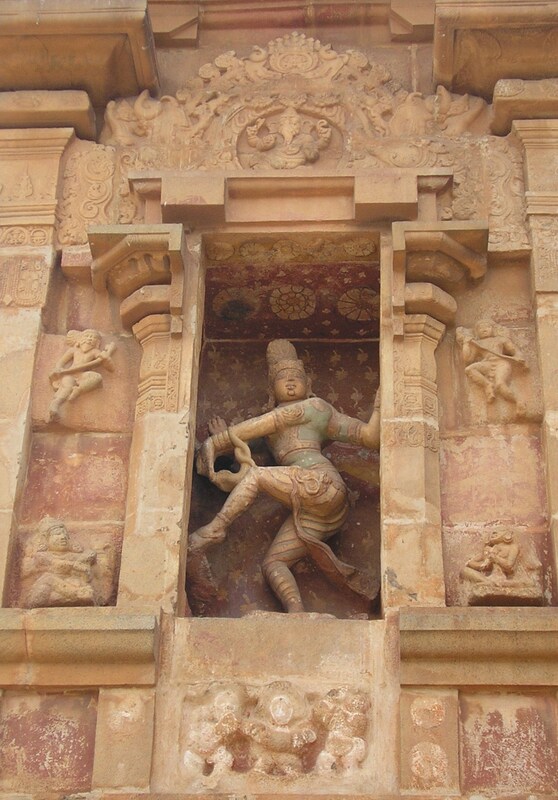 The first to introduce Adalvallan/Nataraja or the Dancing Shiva in a separate Niche in her Temples. 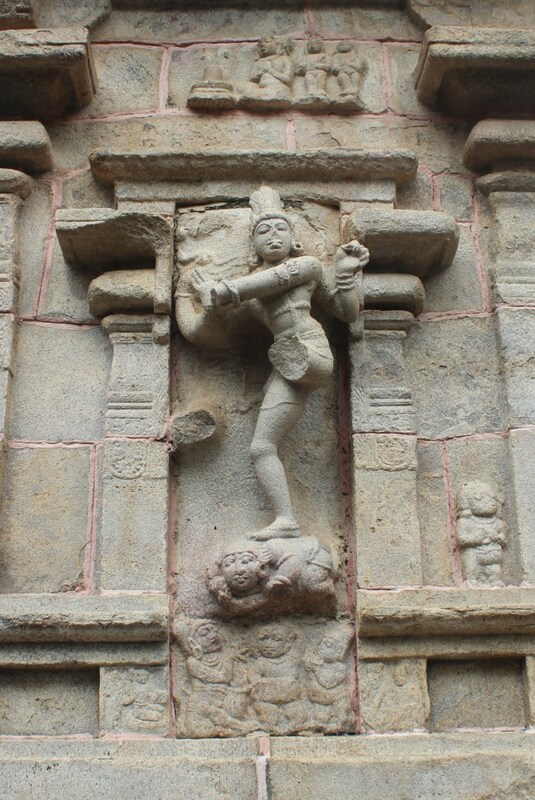 Shiva as Nataraja is seen sculpted in Pallava and Early Chola Temples in various parts of a temple. 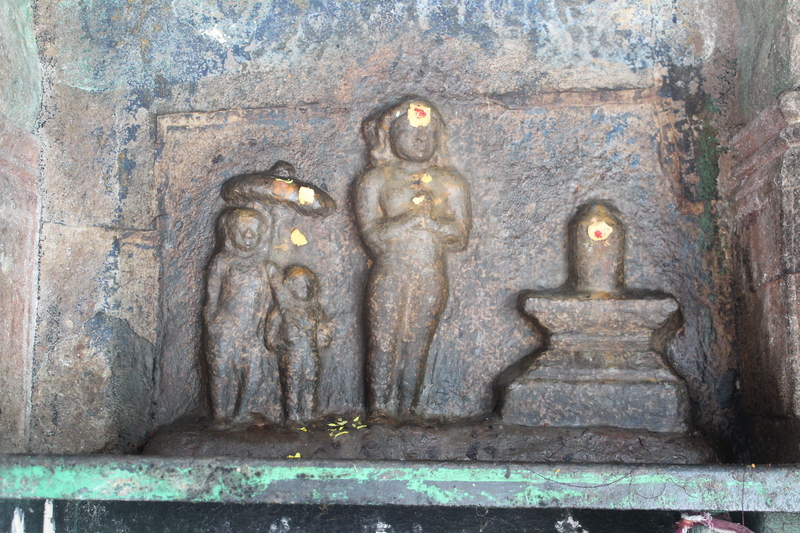 Chembian Madevi provides a special place for Dancing Shiva, giving prominence, sculpting him in a separate niche, thereby emphasizing the concept of Adalvallan. 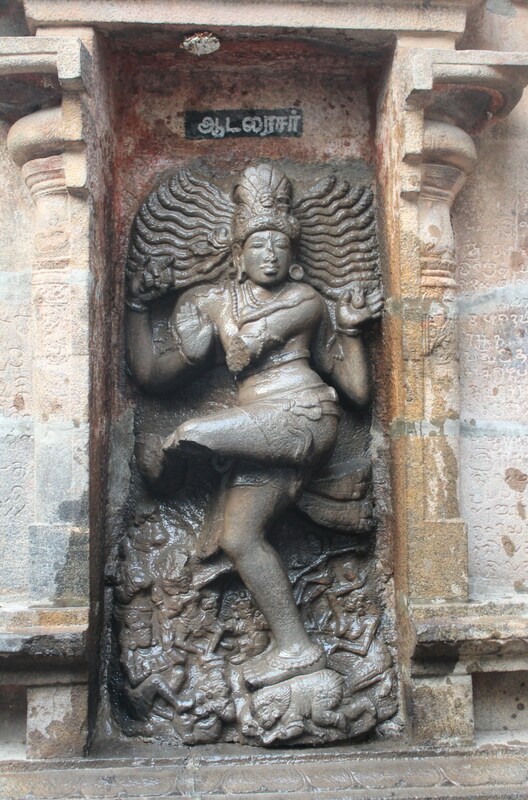 While the Sanctum with Shiva in Linga form is the basis of a temple’s religious enthrallment, the Dancing Shiva in a dominant niche showcases the rich, cultural/aesthetic charm the Creator of the Temple wishes to portray. In the temples built and rebuilt in stone by Madevi, Adalvallan captivates the visitor with his entourage of performing artists. 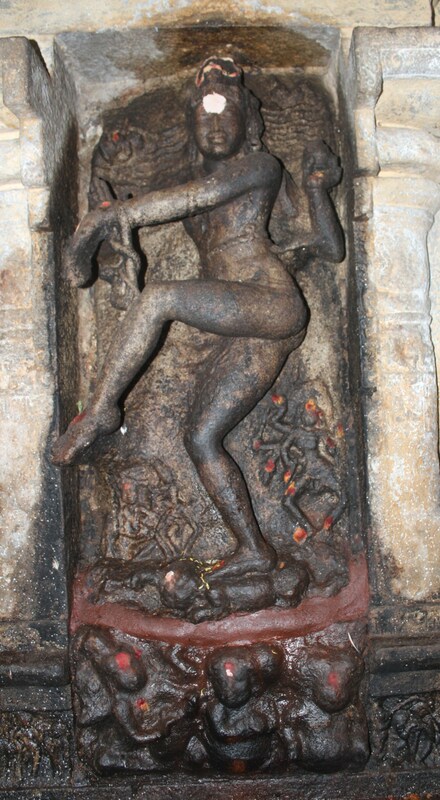 The first to depict Adalvallan/Nataraja and Karaikkal Ammai as the focal point of her sculptures, in the Muga Mandapam -front corridor of her temples. After Gandaraditha (954 ACE) until Uttama Chola, the period Madevi has been very energetically responsible for the construction and rebuilding of Shiva temples; for almost 30 years, she brought Adalvallan and Karaikkal Ammai in lime light, truly carving a niche for herself. As mentioned above, Adalvallan captivates the visitor with his entourage of performing artists with the addition of a spellbound spectator in Karaikkal Ammai (also performing with cymbals and sirattai kinnari). The first Queen to introduce Sage Agasthya in the Muga Mandapam. She has provided an important position to the sculpture of Agasthya, especially in Anangur Temple, where Sage Agasthya is given prominence with Makara Thoranam (Ceremonial Arch) in the Niche. ♦♦There are innumerable sculptures of Agasthya found in Indonesia and sculptures of Karaikkal Ammai in Cambodia and Thailand. A tight knit research between Agasthya-Ammai and Chembian Madevi might bring about a break-through in the research of link of the Tamils with South-East Asia. She became the spearhead of her own stylistic temple architecture, with increased niches. The beautiful temples of Aditya and Parantaka I are known for their simplicity and elegance, yet dynamic artistic presentation with intricate miniatures carved around. Chembian Madevi creates her temples with a multi-faceted tone – Religious Reverence combined with Sculptural Excellence. In her temples, religion takes the front seat with introduction of several sculptures in prominent niches. She seems to have believed in bringing out the complete talent of the artisans of her era that her Temples are loaded with unparalleled sculptures and more niches – certainly a treat to the eyes of both religious and architecturally inclined scholars alike. Inscriptions during Madevi’s period showcase the level of authenticity and perfection she wished to provide to future readers and interpreters. 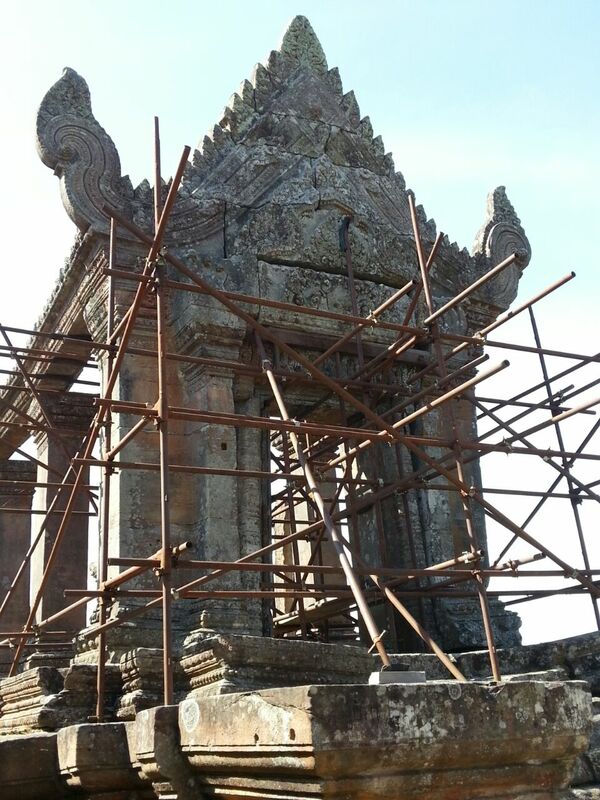 While a temple might have numerous inscriptions belonging to different kings over a period of several centuries, classifying inscriptions in order of different rulers might be time consuming. Chembiyan Madevi records/re-inscribes the old inscriptions, that didn’t belong to her with the phrase – ‘idhuvum oru pazhangarpadi’ – translated as ‘this is yet another previous/old inscription.’ Her clear method of differentiating previous inscriptions reduces much ambiguity. This way, her temples are certainly an Epigraphist’s delight. Chembiyan Madevi makes Karaikkal Ammai play the string instrument ‘Sirattai Kinnari’ for Nataraja, for the first time in Thiruppugalur Temple. Dancing Shiva is always associated with a number of instrumental accompaniments, played by his attendants/ganas. Sangam Tamil Literature mentions several varieties of Percussion Instruments (skin Instruments) and Silappadikaram introduces various musical facts. Different varieties of Percussion, Wind, String and Metal Instruments are depicted in pallava temples, including cave temples. Sirattai Kinnari – is introduced as Tamilnadu’s first bowed string instrument in pallava-pandya sculptures. This instrument which is minimally seen in temples built by Pallavas and Pandyas is seen more in Early Chola temples. Chembiyan Madevi, who introduces Ammai in sculptures also makes the usually ‘cymbal’ handed Karaikkal Ammai play the ‘Sirattai Kinnari’ for her Adalvallan/Dancing Shiva. The beautiful sculpture in Thiruppugalur is one of its own. This clearly shows the spirit of innovation in the Grand Old Lady, who let her sculptor create history. There is a very special and unique accomplishment of Chembiyan Madevi, not only as a Queen Mother but as a Royal Mother-in-law. Her daughter-in-laws – the consorts of Madevi’s son Madhuranthaka present a Bronze Sculpture of their Mother-in-law to Kailasanathaswamy temple in Chembian Madevi village, glorifying her service to Shaivism in Chola Temples. Such was the respect she commanded, within her royal family and the Tamil society, that her own bronze sculpture was sponsored in her honour, most importantly, while she was still alive. This inscription is certainly a manifestation of the greatly honorable position that this Pioneer Lady held. While we hail the western world for their documentation and easily ridicule ourselves on lack of documenting knowledge, we have comfortably forgotten our well built evidences of more than thousands of years of history – TEMPLES. It is high time we start looking at temples as social schools alongside Devotional Institutions. The Tamil Emperors of the past have used temples as Archive Sources of their socio-economic-political lives for future generations through Inscriptions and Sculptures, but we fail to look in that angle as concentration is stuck only on the Devotional Aspect of Temples. That is the reason why websites on Temples, mostly talk about the epics and stories behind the Devotional Build Up rather than the much needed historic evidences that the Temples and the Inscriptions try to tell us.